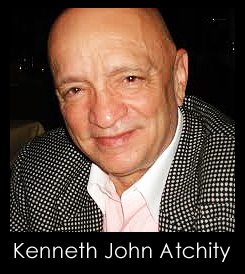 The author of The Messiah Matrix, Kenneth John Atchity, at the age of ten started instructions in the Latin language from a multi-lingual Jesuit mentor and went on to continue his study of Latin, and to begin Homeric Greek, and French, at the Jesuit high school, Rockhurst in Kansas City, Missouri. He won an Ignation Scholarship to Georgetown University in Washington D.C. where he enrolled in the Honors Program as a classics major and won the University's Virgilian Academy Silver Medal for his nationally-tested knowledge of Virgil's Aeneid. At Georgetown, he added to his four years of high school Homeric Greek with studies of Attic and Koiné Greek as well as further studies in Homer and four more years of Latin. He spent his junior year summer at King's College, Cambridge. Atchity received his Ph.D. from Yale in Comparative Literature, after adding Italian as his seventh language, focusing on the study of Dante under Harvard's Dante della Terza and Yale's Thomas Bergin. His Ph.D. dissertation, Homer's Iliad: The Shield of Memory, was awarded Yale Graduate School's highest academic honor, the Porter Prize; and was later published by Southern Illinois University Press (edited by John Gardner). His mentors at Yale included Thomas Bergin, Thomas Greene, A. Bartlett Giamatti, Richard Ellinger, Eric Segal and Lowry Nelson Jr. His fifteen books include Homer: Critical Essays (G.K.Hall), The Renaissance Reader (HarperCollins), The Classical Greek Reader (Harper-Oxford University Press), Italian Literature: Roots & Branches (Yale University Press), and The Classical Roman Reader (Harper-Oxford). He was professor of literature and classics at Occidental College in Los Angeles, 1970-87, served as chairman of the comparative literature department, and as Fulbright Professor to the University of Bologna. Aside from his books, his academic career saw the publication of dozens of papers, lectures, and scholarly articles on Greek, Roman, and Italian literature. During his years at Occidental, Atchity was a frequent columnist for the Los Angeles Times Book Review, where he reviewed the novels of Umberto Eco, Doris Lessing, Gabriel Garcia-Marquez, Carlos Fuentes, and many others. In a second career he represents writers of both fiction and non-fiction, accounting for numerous bestsllers and movies he produced for both television and big screen. He was nominated in 2011 for an Emmy Award for producing "The Kennedy Detail" (Discovery). In the tradition of Dominic Dunne, Sidney Sheldon and Steve Cannell, he has drawn on his professional experience with storytelling to write The Messiah Matrix. His writing, managing, and producing companies can be found at www.aeionline.com, www.thewriterslifeline.com, and www.storymerchant.com.